Make sure to subscribe to the BACID Newsletter! supporting European Integration on local and regional level. BACID Fund: Small grants programme for exchanging knowledge between partners from Austria and Western Balkan & Moldova to strengthen governance. 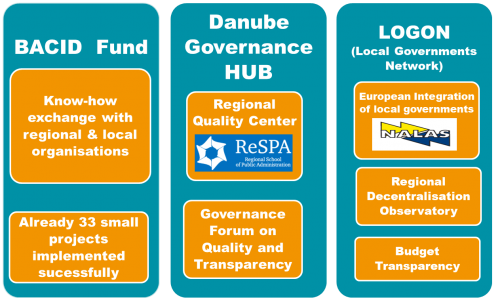 Danube Governance Hub: Establishing a Regional Quality Center for Public Sector and supporting Public Administration Reform. LOGON: Preparing local level for EU-integration, supporting the Regional Decentralisation Observatory and Budget Transparency. The partner countries are Albania, Bosnia and Herzegovina, Kosovo, The Former Yugoslav Republic of Macedonia, Montenegro, Serbia and the Republic of Moldova. More information about the Programme is available on the webpage: About BACID. Feel free to Contact us!